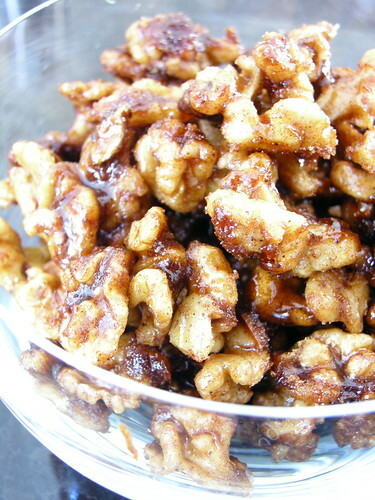 I cannot tell you how much I adore any sort of spiced nut. The cinnamon sugar pecans that they sell at Whole Foods? Man, oh man. When my mom brings a box of those home, they are wiped out within the day. I don't have to tell you twice that all of those pre-made foods at grocery stores can be quite costly, especially when you go through a pack a day. I decided that I would try my hand at making my own nuts. It didn't look that hard, and I hoped that they would be half as sensational as Whole Foods' pecans. 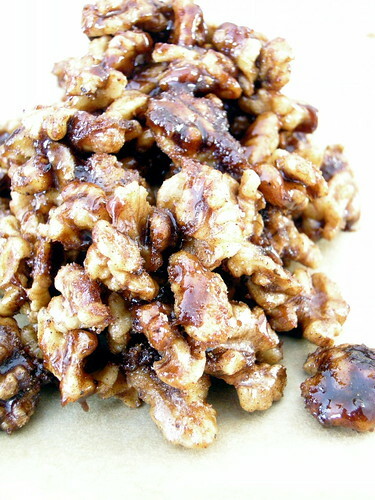 I decided to use walnuts instead of pecans, just for variety. Also, though these are yummy, they are not all that similar to some of the spiced nuts out there. They are stickier and spicier, both very good things in my opinion. These nuts would be the perfect addition to a buffet spread and fit right in with many people's resolutions. They satisfy a sweet tooth, but they won't contribute much to a bulging waistline. My older brother Beau, who doesn't always like my culinary creations, was scooping these babies into his mouth by the handful, so you have got to know they are good. Mix together cinnamon, ginger, cloves, cayenne pepper, and salt. In a heavy saucepan fitted with a candy thermometer, heat water and sugar over medium-high heat. When syrup reaches 236 degrees, remove thermometer. Reduce heat to low and stir in nuts. Keep stirring until syrup crystallizes and becomes dry, about 1 minute. Continue to stir for a few minutes until sugar crystals in bottom of pan begin to liquefy. Add spice mixture and keep stirring over low heat until most of the sugar crystals have melted and nuts are coated. 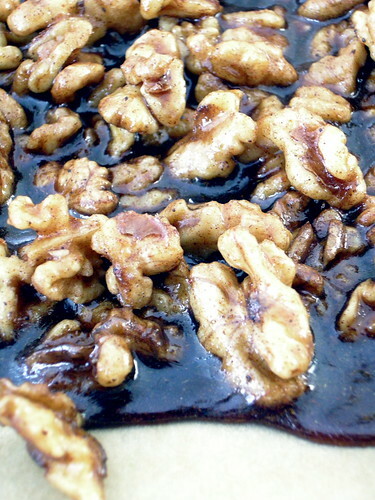 Spread nuts on a baking sheet. Cool completely.